After earning his bachelors degree from Drexel University in Philadelphia, Pennsylvania in 1979, Dr. A. Jon Nannos started his veterinary education at the Aristotle University School of Veterinary Medicine in Salonica, Greece. He graduated in 1984 and returned to Philadelphia to complete clinical rotations at the University of Pennsylvania School of Veterinary Medicine in 1986. 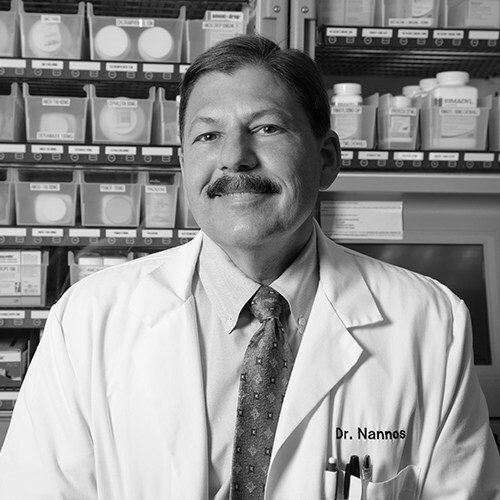 Dr. Nannos then completed an internship in medicine and surgery in 1987 and a residency in surgery in 1990 at the University of Pennsylvania. From 1990 to 1993 he instructed veterinary students in surgery at the Veterinary Teaching Hospital of the University of Pennsylvania as a faculty orthopedic surgeon and lecturer. Dr. Nannos joined MVA in 1993. He performs all aspects of surgery, with a special interest in orthopedic and neurological surgery.